Glass Beach: I'm in print! 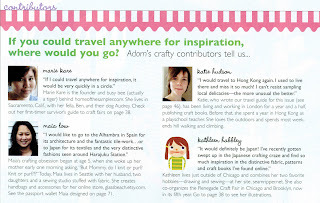 Several months ago, Adorn Magazine contacted me to design a Passport Wallet for them and today my issue hit the newsstands! but this is the first time I've been hired to design something outside my Etsy world! ps Adorn is offering a great subscription offer to Etsy members! Check it out! pps I'll be adding some Passport Wallets to my Etsy shop very soon! Please let me know if you have any questions or problems. Thanks!! No way!!! You are so cool! Can I admit I have a subscription to Adorn already? I haven't gotten this issue yet but now I can say I knew you when :) Yay!! Thanks you guys! I'm still kind of buzzy about it. awesome! congratulations! I just subscribed a week ago! you don't know me, but i was searching for passport wallets and i fell in love with the one you designed for the magazine!!! and i wanted to tell you that here where i live, wallets like that would be a serious hit and i am going to tell all the women i know about your site so they can check out any new ones you make! keep up the work because we'll be checking in! you have a great talen especially with colors! I LOVE this! I saw it in Adorn when it first came out. I have the pattern but not the instructions. Could I PLEASE PLEASE see you tutorial? I can't seem to find it anywhere. This would be a HUGE help! Thanks, Noora! I'm planning on posting a PDF of the passport wallet instructions here on my blog in the next few weeks! thanks so much for reposting the directions for this! I tried to go to Adorn's website, but it was gone.. :( I will be trying my hand at this over my long weekend coming up! thanks again! !